Charles B. French Official Site: How I Met Your Mother: "46 Minutes"
Quick Review: Mostly annoying with a few funny gags and a tolerable close. Spoilers ahead, so watch the episode before you proceed. Of course, you are free to proceed without viewing the episode, but then don't whine to me about spoilers. Spoilers. Worst Episode Moment: Pretty much anything involving Ted. Creepiest Episode Moment: Mickey (Chris Elliot) and the Widow Rodriguez. Best Character Interaction: Mickey and Marshall over the intercom. Worst Character Interaction: Robin and Kevin playing relationship chicken. Best Character Progression: Sadly, no one progressed this week. Worst Character Regression: The rest of the gang sans Marshall and Lily. Best Callback: Russian Stripper Lily. Any hint about The Mother? I worry if she willingly decides to hang out with this group. Any hint about The Wedding? Hopefully Lily nixes any and all strippers. Do we like Ted this episode? Not at all. Yes, he learns a lesson at the end, but that doesn't make up for him being really annoying. Even first-season Ted was more interesting. Overall Opinion of the Episode: This one had its moments, but the overall package was annoying. The theme this week was abandonment and trying to make connections. 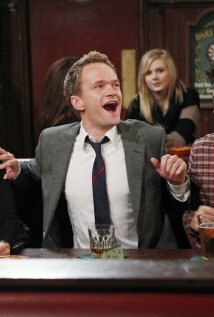 Robin, Barney, and Ted felt abandoned and tried to make a connection with a stripper and her insane boyfriend. Lily's dad Mickey was trying his best to reconnect with his childhood and with his daughter, son-in-law, and grandson to be. This episode could have worked, but it just felt like it was killing time until the final beat. That's been happening a lot this season. Rather than have the characters develop, or have the plot be a natural outgrowth of who they are, the characters are simply reshaped to fit the story. It makes the characters inconsistent and hard to watch, because if they are only there to serve the plot, then we have no more emotional investment with them. I want to still love these characters, but the writers are making it harder and harder each week. A much better episode would have covered the course of perhaps a week, with the friends struggling each night to adjust to an emptier booth or try to fill it each day with someone new. Instead, while the ending was good, it wasn't earned by the episode. It tried, but the sweet moment felt tacked on and contrived, and not the result of the kind of character progression this show used to give us. This episode had a few cute moments; the overall impression I have, though, isn't favorable. They tried too hard, they didn't let the characters be themselves, and they put too much into one episode and made it feel forced and contrived. It makes me fear for the end of the series. This is supposed to be a "Love Story told in reverse," but the romance is all but gone in this show. I just hope the ending to the series isn't as tacked on as the ending to this episode.